Shakshuka? I Hardly Know Ya! Wow -- what a terrible title. Consider it a working title until I can come up with something better. Nope, I'm keeping it. Actually it looks exactly like that! Shakshuka is an Israeli breakfast dish in which eggs are essentially poached in a thick, spicy tomato-based sauce, often with a little cheese melted in, and served with pita. 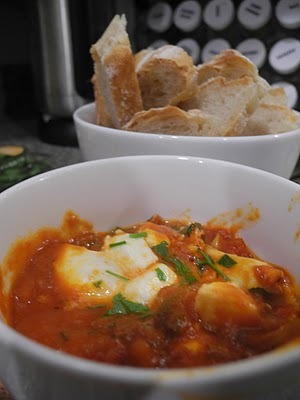 Much like any stew or sauce, there are myriad combinations and tweaks that a chef might bring to shakshuka to make it his or her own, but for a change of pace and because this constituted a first attempt, I stuck to a recipe. I didn't even know I could still DO that. Except for using baguette instead of pita. Now, for anyone who thinks Smitten Kitchen has blogging monopoly on shakshuka -- you're right. So, I worked off her recipe! It's quite easy; in fact, shakshuka falls into an excellent category of recipes I call "Looks impressive, tastes awesome, costs nothing and is super easy." This is a super dish for brunches, because although it requires that the chef pay some attention, it's unique and will leave a lasting impression on your guests. It's heavily spiced but not overly spicy; there's rich, smoky depth of flavor, and the texture of the silky homemade sauce jives well with the egg and cheese and is perfectly complemented by crusty bread or pita. To start, dice up the onion and jalapenos (wash your hands and don't touch your eyes, people). In a heavy-bottomed pot or deep pan, cook the veggies over medium-high in a few tablespoons of olive oil until the onions turn golden, about 5 minutes. Don't cook 'em too long; you don't want them to totally break down in the sauce. Then, add the spices and halved garlic cloves and cook another two minutes or so, being sure to coat everything in the paprika and cumin. As a quick aside, I know some people stress about ensuring absolutely correct measurements for spices. DON'T. Unless you go totally nuts and dump in handfuls of cumin or something, you can't screw it up. If you add too much, you've just created a new version; shakshuka a la YOU. Ok, now here's the fun part -- it's the cooking equivalent of finger painting. Dump the tomatoes out from the can, with their juices into a bowl then SQUISH THEM ALL UP WITH YOUR HANDS. That's right. With your HANDS. "But Hungry Sam, I don't wanna use my hands," someone might say. "Isn't there an alternative?" "NO," I say. Go big or go home, right folks? Anyways, throw the hand-crushed tomatoes in with the onions et al, and reduce heat to medium. Simmer 12-15 minutes, stirring every few minutes and adding up to a 1/2 cup of water if things start getting dry. Looks like the shining orb of a star! I'd cover the pot at this point, if you can; I feel the eggs cook more cleanly that way. After about five minutes, the yolks will be semi-firm and good to go. At this point, turn off the stove, and carefully mix in the crumbled feta. Top with chopped parsley and dig in with some sliced bread! Behold! A tasty tower of tantalizing tomato! 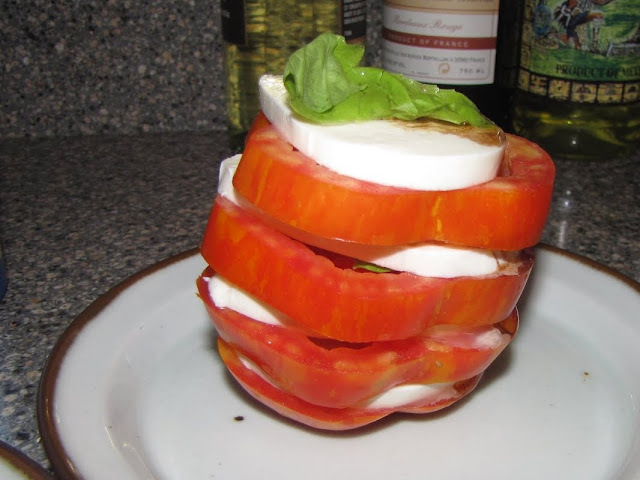 First, the delicious stacked heirloom tomato Caprese salad. Most of the dishes I make, though tasty and creative in their own right, are reasonably straightforward -- I don't generally do postmodernist deconstruction of recipes as you might find in a small plates/microdining gastropub (or whatever the kids are calling 'em these days). However, after a long bicycle ride out at Antietam battlefield with Jim and the BMC, we stopped en route home at a Mennonite farm stand which had a truly beautiful array of mottled, firm, heirloom tomatoes* for sale.